Binoculars have been used for hundreds of years to help people see things from afar. In past times this was essential to prepare for battle on land or at sea and to make every hunt more successful, whether for pleasure or necessity. However, times have moved on and the world has become a digital place. Binoculars can still play a part at sea and in hunting, perhaps even in watching sports but they have been threatened by the advancement of technology. A good digital camera can use both digital and optical zoom to magnify subjects which are hundreds of meters away. In fact, combine digital technology with the best rangefinders and the best night vision goggles and you’ll be able to hunt successfully in the dark. Fortunately, there are other uses for binoculars, particularly star gazing and bird watching. Night vision might aid you at dawn and dusk but most birds are not active at night. Combine a pair of binoculars with a good digital camera and suddenly you have the ability to see and film your subjects. Whether you want the images for a private collection, school project or simply to post to YouTube you will suddenly appreciate why the best digital camera binoculars should be an essential addition to your personal belongings. But this is where the problems start. There has been an explosion of different camera binoculars, binoculars with cameras and even plenty claiming to be the best digital camera binoculars. It is difficult to know which set is right for you. Luckily, we are here to help! Not only have we looked at the different binoculars with cameras we have produced a guide to help you in choosing and purchasing the right one. It is important to consider all the relevant elements before you choose. Even though all the products which appear on this best digital camera binoculars list are excellent they will not all suit your needs. Use the guide to find the right one! First off, we’ll mention that this digital camera comes at a very reasonable price. It’s not the cheapest on the market, but for what’s included in the kit it’s a worthwhile buy. Apart from the digital camera binoculars you also get a pouch for safe keeping and a cleaning cloth. The case itself is an asset as it’s precision designed. The binoculars with camera features won’t shift around inside so it can’t be harmed by unnecessary friction. Thanks to a zippered compartment and Velcro divider your binoculars are kept secure. There’s even a mesh pocket to keep small accessories. The bag is padded so your Vivitar is kept safe even if you should accidentally bump it against something. This is quite necessary as some consumers feel the binoculars themselves are quite delicate. You’ll have to handle them with care to prevent damage. There’s a sturdy handle on the bag which makes it easy to safely carry your binoculars with you, even if you’re carrying multiple items in your hands. The cleaning cloth is just as impressive as it actually has anti-fog properties. It’s designed for the Vivitar but keep in on hand for all your gadgets containing lenses or screens as it’s safe to use on most of these items. Just note that it has a limited number of uses. After 200 times it won’t work as well anymore. This set of binoculars with camera weighs 1.3lb. It’s not light, but still comfortable to handle for most adults. When it comes to the technical aspect, the binoculars impress with a magnification of up to 10x. Yes, you’ll find more advanced options on today’s market, but a rating of 10 in this department is quite standard for this niche. You make focus diopter adjustments with the wheel found in the center. It’s easy to reach with any of your fingers so this is a quite a user-friendly gadget. On the sides of the binoculars, there are textures pads so you can have a firm grip even if you have sweaty palms when using this in hot weather outside. And that’s exactly where most users decide to use this: it’s perfect for nature lovers who want to get a closer view of a bird sitting far away or to capture details while watching a sports game. However, it’s also practical for theater viewing. When you want to capture a special moment or image you simply press the button to send the image to the unit’s memory. You can store up to 160 images at a time, so it’s quite sufficient for a day out in the field or next to the sports field. Just try it out before you take it on your first excursion, as some owners have complained that the buttons don’t always respond well and then it takes a few presses before the image is recorded. Make sure you don’t have a defective unit. When you get home you can download the images to another device. This is one other area where some consumers express some concern. The software isn’t always easy to install on computers, so you may need some assistance from the manufacturer. Note that the software can be downloaded from the web if the provided disc doesn’t seem to work. Important fact: this set of digital camera binoculars doesn’t contain a separate viewing screen. You can only view your shot through the binoculars themselves. Tip: Take good care of the provided cable as generic ones may not work. Despite a few concerns, this unit is rated almost 4 stars out of 5, so it’s worth ordering before your next outdoor adventure. Black and silver is a common theme on these binoculars with a camera. The GordVE HD adopts the same approach as many competitor offerings with a central black piece moving into silver hinges which then stretch into black arms. The LCD screen is 2 inches and it is interesting to note that these binoculars with cameras have opted for the traditional LCD screen, as opposed to an LED one. The screen pops up in the middle of the midsection, in fact when it is folded down it is virtually invisible. It shows you exactly what you see through the binoculars as its pick up it is sandwiched between the lenses of the binoculars. This means if you focus on the detail of something 500 yards away the picture will show what you are seeing through the binoculars, not what you can see with your naked eye. There is the now familiar to buttons on the top of the binoculars to operate the camera and the memory card slot as well as the micro USB slot between the eyepieces. A further two buttons finish the camera controls; these are situated under the screen and are only visible when the screen is open. Both arms on the camera binoculars can be moved to ensure they are a comfortable fit on your eyes. This adjusts the width. Then, just as with any other binoculars you close one eye and set the focus with the large, central focusing knob. Once this is done you can open the other eye and fine-tune the focus. Your binoculars with a camera are then ready to use, as a camera or just binoculars. It arrives with a comprehensive instruction manual, the charging / downloading cable, neck strap and a soft cloth for cleaning your lenses. It measures 5 inches by 4 inches with a depth of 3 inches and weighs just under a pound. You will benefit from a magnification of x12 and an objective lens of 32mm, designed to let in as much light as possible while keeping these best digital camera binoculars within the compact range. The field of view is 96 meters at 1,000 meters which is good if you are hunting or bird watching. They will even give good results if you are planning to watch the next game with them. The exit pupil diameter is 2.08 with an exit pupil distance of 12mm. The near focus is also good; you should be able to clearly see items just 4 meters away from you. The video is again n AVI format with pictures in JPEG. Image resolution is a satisfactory 1280 x 960 although you can reduce it to 640 x 480 to extend your memory space. However, the picture quality is again at 1.3 megapixels. Whilst this is adequate you will notice the difference between it and videos that you record on a digital camera or your cell phone. 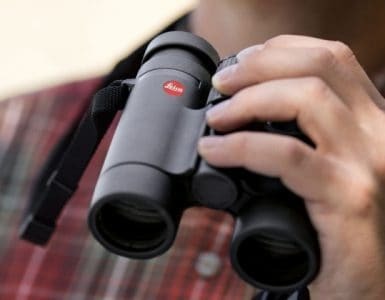 The binoculars have a lithium battery which will need to be recharged by plugging the binoculars with the camera into your computer or a mains adapter. You can also put it on a tripod but you will need to purchase an adaptor separately. It is worth noting that there is built-in memory on this camera with binoculars. What is impressive about this camera and lifts it above the others on this list of best digital camera binoculars is the fact that it has a 98% user rating of 5 stars and the remaining 2% have given it 4 stars. This is difficult to beat and a testimony to the quality if the camera you are getting for a reasonable price. All three of these cameras are in the $100 to $150 price bracket but the offering from CamKing wins the best value award out of these 10 best digital camera binoculars on account of its excellent feedback. This really does look like a spy scope! Dressed in black it has a digital screen where you would usually look through the eyepieces. This is stylishly designed and incorporated into the build of these binoculars. The screen is 2 inches but can be quickly converted to 4 inches, taking up the whole end of the binoculars in the process. The shape of the binoculars is compact and stylish, tapering to the individual lenses. It is black all over with several buttons set in the center of the device. Each side has a slim section of anti-slip rubber to help you grip these impressive binoculars. It is worth noting at this point that the price of these binoculars is in the $350 – $400 range. These are a class above the competitors on the best digital camera binoculars list. The inbuilt screen is 320 pixels by 240 which makes it clear enough to see all the detail of the subject you are pointing the binoculars are. It is worth noting that these camera binoculars weigh 1.68 pounds and measure 8 inches by 6.65 by 3.46 inches; small enough to fit comfortably in your hand. The specifications on this contender are impressive. It uses a micro SD card which can be as high as 32GB; a 4GB one is included. You will also need 8 AA batteries which are not included. The eyepieces are adjustable to ensure they are comfortable if you choose to use them. It has an infrared spotlight which will provide excellent images as far away as 400 meters even in the middle of the night. You can magnify the object seventies and the objective lens is 31mm, large enough to let you see everything clearly in the daylight. There is also a digital zoom of x2. The field of view is 9° while all images are recorded as jpegs. The camera can focus on images as close as a 1-meter ad you can display the images on your computer or TV. In fact, you can link the camera binoculars to your TV and leave them outside to act as a security camera; you can see everything on your television. A neck strap, protection bag, and cleaning cloth are included alongside several cables for connecting your camera binoculars to either the TV or your computer. The infrared feature will even allow you to take black and white photographs at night. Even the IR levels are adjustable to ensure you have the right amount of light for your chosen setting. The fact that it is waterproof and fog proof is simply a bonus. It is not surprising to find that the Bestguarder NV800 has received positive reviews. It looks fantastic and does exactly the job you need, even at night. But, it does come with a price tag to match. For this reason, it is a contender for the best binoculars with a camera in our best digital camera binoculars award, provided you have the budget for it. Certainly, users who have purchased this item have provided very positive feedback; it currently has 100% giving it 5 stars. 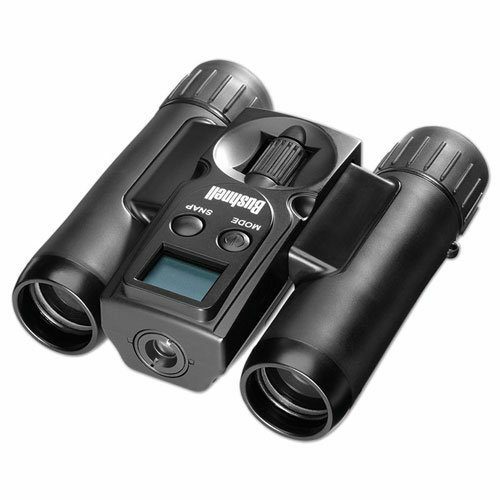 The camera binoculars offered by Bushnell is an all-black number which is incredibly stylish. It adopts a very different look and approach to the previous contenders on this best digital camera binoculars list. The first thing you will notice is that it is completely black, with the exception of the name written across the center of the camera binoculars. The two telescopic sides appear to be suspended although they are joined by black hinges which are a triangular shape. This allows the binoculars to be adjusted to fit the width of your eyes. They can also fold inwards to decrease their size when you’re carrying them. There is a small space between the eyepieces and then the center portion starts, with a dip to accommodate the focus wheel. This is large enough to be operated even with gloves on. Above the wheel are two buttons for operating the camera and a small screen which will enable you to see the commands you have given the camera. Despite being relatively square the camera binoculars fit snugly and comfortably into your hand. The lens end appears to be no bigger than the soft rubber caps at the end of the eyepieces. Between the lenses you will note the camera aperture; this is separate to the binocular lenses. 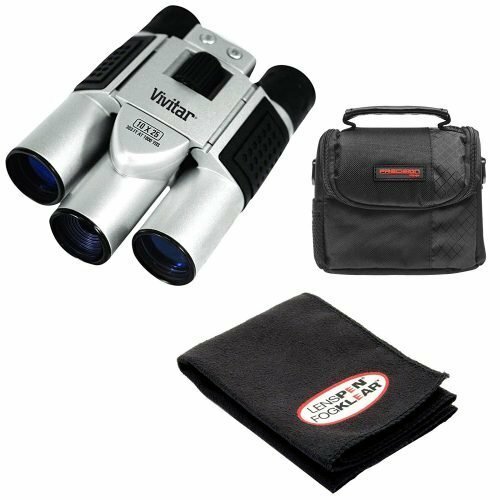 When you order these camera binoculars, which can be had for under $100, you will receive a battery charger, rechargeable batteries, neck strap, and a cleaning cloth and kit. The 4 AAA batteries are fully rechargeable. These items measure 7.8 inches by 7 inches and 2.3 inches with a weight of just less than one pound. The binoculars have a magnification of x10 and an objective lens of 25mm. The separate camera has its own magnification which is x8. The digital camera is 1.3 megapixels, although not on a par with your cell phone or digital camera it is at the same level as many of the other best digital camera binoculars on this list. Pictures are stored in JPEG format and the video is AVI and records in VGA. It can also be mounted on a tripod although you’ll need to get the adapter for this. There is a built-in memory as well as an SD card which can take up to 32GB. A nice touch is the remote shutter cable. You also get the USB cable which will allow you to play the videos and images on your computer or download them for future use. The binoculars use a roof prism which dramatically enhances the abilities of these compact camera binoculars. 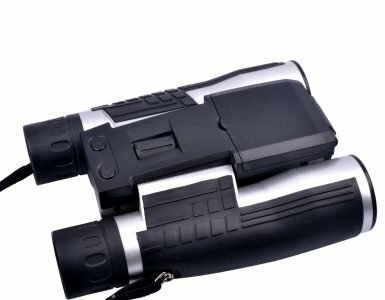 In fact, the only reason these stylish camera binoculars are not the best value out of the best digital camera binoculars is that the user reviews are not as good as they could be. Only 68% of users rate them with 4 or 5 stars and a relatively large 12% rate them with just 1 star. The majority of issues seem to revolve around the difficulty in taking a long distant picture. The image you can see through the lenses will be adjusted when you push the button to take a picture. This is because it requires a reasonable level of force to push the button and it is virtually impossible to do this without moving the binoculars. Of course, this can be resolved with a tripod and should not be enough to put you off considering these binoculars. They are still an excellent pair of camera binoculars. The Fitiger 1080P is a remarkably similar looking set of binoculars with a camera to the previously reviewed Kingear. The same silver pattern radiates out from the center to black side pieces. The rubber grips look different but essential to fulfill the same function and occupy nearly the same position as our first contender. Even the price range of these camera binoculars is similar to the Kingear. 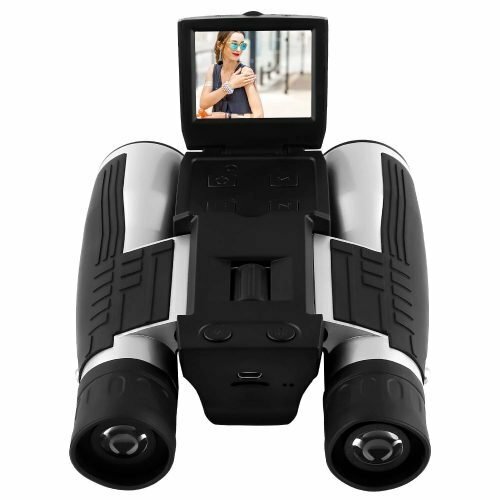 The large center section occupies nearly the whole length of the binoculars with a 2-inch pop-up LCD screen and the micro USB port with memory card slot sandwiched between the eyepieces. In addition, the two buttons to control the camera are mounted on the top of this section! You will find a loop on each side of the eyepieces which is ready to take the neck strap. The focus wheel is set in the center of the central piece but is large enough to be easily turned while looking through the binoculars. There is no doubt they are stylish but they are a more recent release and their design is uncannily similar to the Kingear. Fortunately, there are differences in their abilities. For starters, this offering is heavier, weighing in at 1.2 pounds. It measures 7.6 inches by 5.59 inches and 2.91 inches. The magnification through this addition to the best digital camera binoculars review is x12 with an objective lens of 32mm; allowing significantly more light in that the offering from Kingear. At 1,000 meters it will provide a field of vision of 96 meters. The exit pupil diameter is impressive at 3.8mm while the exit pupil distance is 8mm. You can focus on any object from 8 meters onwards. Again the video is recorded in AVI while the images are JPEG. It has several screen resolution settings; the best is 1920 x 1080 while the images are best at 2592 x 1944. It can record 30 frames per second and store additional videos or images on a TF card; up to as much as 32GB. The picture quality is better on these camera binoculars thanks to an optical sensor providing 1080 megapixels. 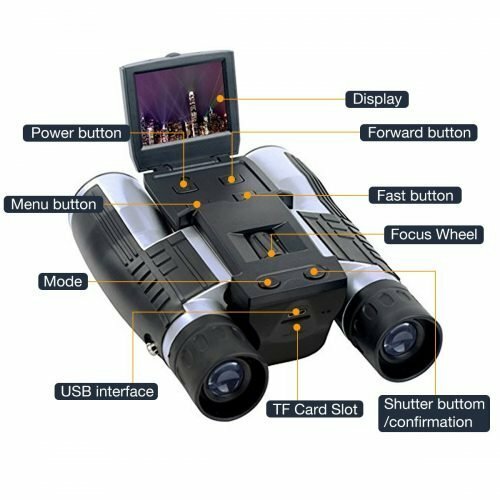 You can connect these binoculars with a camera directly to your computer via the cable provided, it also offers free web camera support and the instructions are available in a wide variety of languages. You will get a cleaning cloth with this product but no case. An additional and useful feature is the ability to record in HD, both videos and images can be done this way; ensuring you have the best possible souvenir of any view. There is no doubt that this is one of the best digital camera binoculars currently available and the price is reasonable considering what it can do. It scores an impressive 89% of users giving it 4 or 5 stars. Again, there are very few issues with the well-designed camera binoculars. In fact, there are only four 1 star reviews and half of these question the validity of the other reviews; this does not help you to evaluate the product. The other two had a problem with their memory card and didn’t feel that the camera operated as well as it should. This is hardly an overwhelming reason not to purchase the Fitiger best digital camera binoculars; it is a genuine product which should be seriously considered if you are looking to purchase binoculars with a camera. This offering is predominantly black but has silver along the center hinge lines and down the inside of each eye of the lenses. The outer side of the lenses uses a ribbed rubber to provide an anti-slip facility. This is a good idea as the camera binoculars sit in the $100 price range; not something you want to drop in a hurry! The style is very similar to a classic pair of binoculars however the central piece runs most of the length of the binoculars. Built into this a screen which folds flat against the binoculars and opens up, to allow you to see the image, before taking a picture. You will also note a micro USB port at the end of the centerpiece, between the eyepieces. Below this is an SD card slot and the top side has two buttons. The side arms can fold into to make this a relatively compact set of binoculars with a camera. The actual dimensions are 5 inches by 4 inches by 3 inches, small enough to fit in the palm of your hand. It weighs just under a pound. The binoculars have a magnification of x12 with an objective diameter of 32mm. This is coupled to a 12mm exit pupil distance and a diameter of 2.08. At 1,000 meters you will still have a field of view equivalent to 96 meters. This is perfect for bird spotting. Included with these contenders for the best digital camera binoculars are a neck strap, small carry case, full instructions and a micro USB to USB cable for charging and downloading images. If you’re not happy they’ll exchange your camera binoculars for another product; without charge. The screen size is 2 inches, big enough to see what is going on at the other end of your camera binoculars but not big enough to help you identify specific subjects until you play it back later. Photos are taken in JPEG and videos in standard AVI format. The image sensor is 1.3 megapixels with a resolution of 1280 x 960; for pictures and video. This is where most concern should be raised. 1.3 megapixels is low in comparison to many of the other products on the market; you may not see the detail you hope for in playback. It also comes with a free 8GB TF card to save your images and videos. 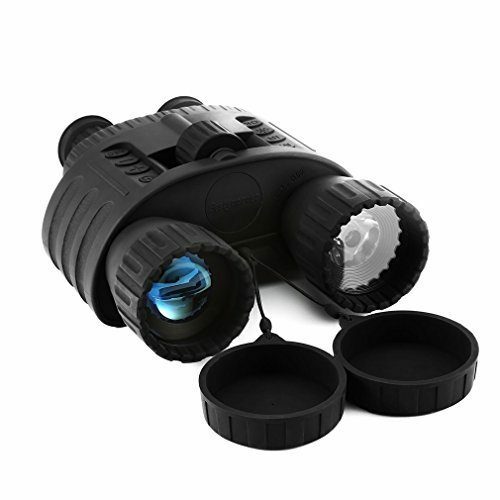 You can also purchase support and mount these binoculars with a camera on a tripod. It is important to note that these binoculars do not have a microphone, you will not be able to record any sounds. Despite concerns over the ability of the camera, 60% of users have given this either a 5 or 4-star rating. That’s impressive for any product. If you are looking for something that takes wonderfully crisp pictures, we recommend you rather buy a digital camera. It is, however, certainly value for money. 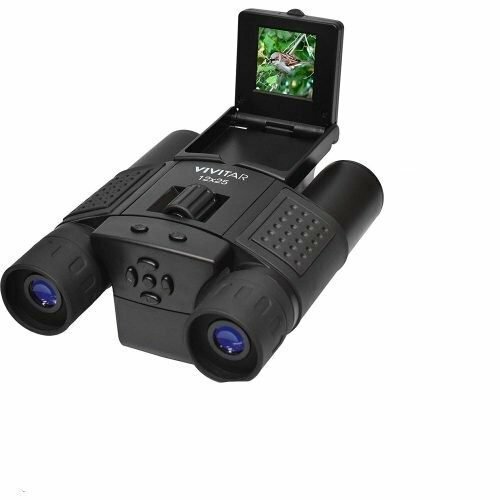 This is a truly unique item on our list as it’s not a complete set of digital camera binoculars but it converts your SmartPhone and your binoculars into one. The adapter firmly latches onto your binoculars and then provides a safe place to insert your SmartPhone. Now your phone has an enhanced zoom function so you can take epic photos from afar. The unique approach to having binoculars with camera features, carries a number of benefits. This device is a bit cheaper than some other options showcased in this article. If you’re shopping on a budget this may be an ideal solution. What makes the price even more inviting is that it gets you a comprehensive kit, not only the adapter. Snapzoom provides all you need so you can do more during your next photography session. There’s a screwdriver that’s appropriate for the parts you’ll use and a counter weight kit will help you take quality pictures thanks to added stability. All of this is kept inside a utility bag with provided padding so your new gadget is safe from dust, damage and moisture when you carry it around. Of course an adapter is only valuable if it’s compatible with the gadgets you already own. Luckily Snapzoom caters for quite a large niche. While it’s specifically designed for larger phones, you can attach many different models. For phones with a thickness as much as 0.79” it will easily work. It can take phones up to 3.67” wide. Simply slip it into the eyepiece jaw and it will clamp it firmly. One of the reasons why it works better with large phones such as the iPhone XS or Samsung Galaxy S9 is because the counterweight ball was designed with their dimensions in mind. Getting stability when you’re taking magnified images is vital, as you’ll need assistance to counter shake and avoid blurry images. The unit itself measures 6.8” x 6.5” x 2.5”. On the other side of the adapter, you’ll attach your eyepiece, such as binoculars. You’ll find it user-friendly with any device if the outside diameter is between 0.91” and 2.17”. It must be at least 1” high to work effectively. Those in the know say it’s important to have 20mm clearance between your eyepiece and the focus plate. If you don’t it will be difficult to attach the adapter flush on the eyepiece and this will affect image quality. An interesting application for these adapters is to attach SmartPhones to microscopes, so it caters for more than the digital camera binoculars niche. 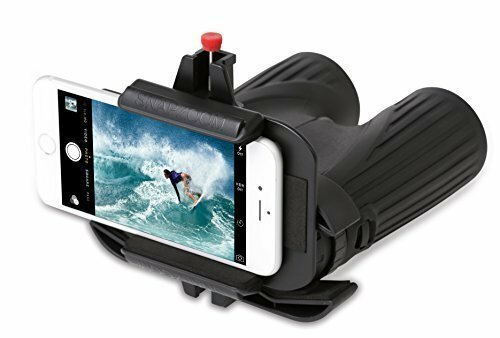 It has even been used successfully with telescopes, so you can now take pictures of remarkable view in various scenarios apart from creating binoculars with camera features. Note that even though it’s simply an adapter it still weighs as much as some camera binoculars do by themselves. What it allows you to do with your SmartPhone makes it worth the bit of extra weight. Anyone can now have digital camera binoculars without purchasing a new set of binoculars. Your zooming options are only limited by the binoculars themselves. Some consumers find it difficult to press the camera button on the screen while keeping the entire unit still; though this applies to large binoculars mostly. Depending on the SmartPhone you use, the adapter may end up covering some of the buttons. This means you may not be able to turn off the screen between shots which can lead to a quick battery drain. Also, it takes a few seconds to attach everything so you’ll have to practice and get comfortable to track objects with the SmartPhone in place so you’re ready to take the winning shot the moment it happens. It’s not perfect but opens up so many possibilities for SmartPhone owners to have binoculars with camera functions. No wonder it gets a combined rating of 3.5 stars on most platforms. 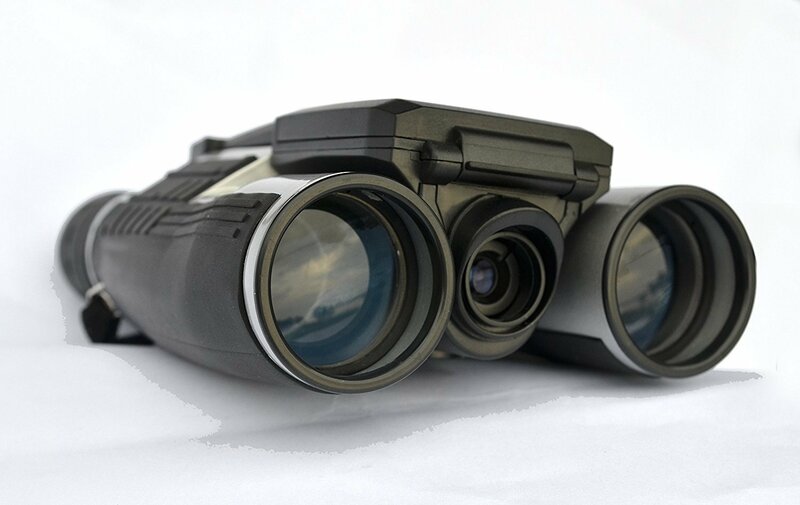 There is only one word which adequately describes these camera binoculars from Vivitar, cool. The screen pops up from the center of the binoculars and there is a blue light which illuminates between the eyepieces. This sits just below the memory card slot and the jack point and gives the camera binoculars a spy look. On top of this section are three buttons which operate the camera function. Each side piece is attached to the center via the hinge which allows the pieces to slide in close and keep the compact look. The outlook lenses are larger than the eyepiece which gives the camera binoculars a stylish sloping look. The focus wheel sits in the center of the binoculars and can be adjusted from either side of the binoculars and the name is written just above the focus wheel. Each side has a soft rubber wrapped around it to create an anti-slip grip. This will help to ensure the binoculars stay in your hands. Of course, if you do drop them then the rubber grips will help to cushion the fall. It is worth noting that they are water resistant but not waterproof. These camera binoculars are 11 inches by 9 inches with a depth of 4 inches. They weigh 1.13 pounds and can be easily carried with you virtually anywhere. This camera requires 2 AA batteries which are not included when you purchase it. You can use rechargeable ones if you like. The magnification on the binoculars is X12 with an objective lens of 25mm which means it has a reasonable ability even in low light. However, it is worth noting that the camera has its own aperture and the magnification is slightly different, it maximizes at x10. The images on this camera binocular are saved in a JPEG format and are 8 megapixels. The video is VGA and you have the option to add a memory card up to 32GB. You can download these images directly to your computer or watch them on the television if you have the right cables. The screen is 1.44 inches and the controls are excellent. You will be able to operate these camera binoculars in moments as they are labeled ‘power’, ‘shoot’ and ‘preview’. The binoculars have a 4.6-degree field of view; you can see 90 meters at 1,000 meters which is good enough for bird watching or sports. The exit pupil distance is 21mm with a diameter of 3.1 making them the perfect size for your eyes to absorb as much light as possible. The onboard memory will allow you to take up to 160 pictures; you can easily take more by adding a memory card. An extra feature which will keep many people happy is the ability to share pictures and videos directly from the camera; all you need is a Wi-Fi connection. You also get editing software, a shoulder strap, soft carry case, and complete instruction guide. This addition to the best digital camera binocular list is a good example of camera binoculars but it struggles to deliver under review. We have found that the camera isn’t particularly useful and neither are the binoculars. While the idea of a camera and set of binoculars is appealing, the actual execution of such an item has left us wanting for more. You will see that many people are not happy with the size of the Vivitar and don’t feel it works as well as it should. Bestguarder have another offering in this best digital camera binoculars review and it is another top end product. There is no doubt that this is in a class above most of the others on this list. The fact that you can buy it for between $375 and $425 reflects this. But, if you have the money you may find that it is the perfect solution for your needs! These Bestguarder’s stick to the more traditional style of binoculars. They have an all-black body which curves at each side to incorporate the lenses on each side. There are lens caps to help protect the lenses from damage in transit or even in use. This is the first thing to check if you can’t see anything out of these camera binoculars. The focus wheel is set in the middle of the binoculars and raised slightly to ensure that you can easily access it; without having to look. The binoculars also have a 1.5-inch screen to assist you when videoing or taking pictures. 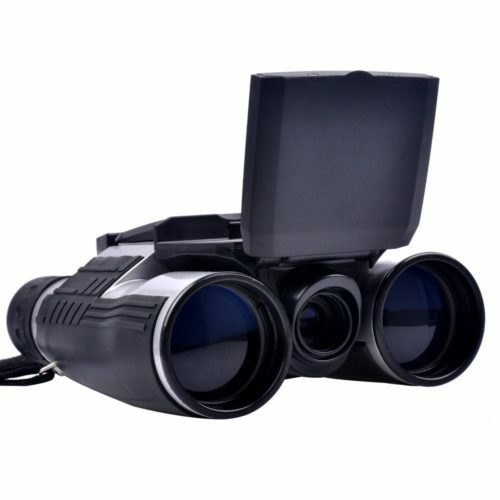 These camera binoculars can focus on items as close as 2 meters as well as see objects at 300 meters, even with no light. The eyepiece has an exit pupil distance of 8mm and a diameter of 12mm which allows it to focus effectively at 37.5mm. Pictures are 5 megapixels and in JPEG format and video has a resolution of 1280 x 720 with full sound! It is also worth noting that the pictures can be taken in HD format. You can add a memory card to your binoculars; it accepts TF cards up to 32GB, although one is not included. The optical magnification is 4 while it has a digital zoom of 5 and a field of view of 7 inches and the aperture is 1.3. There is a wide field of view and you can display the image directly to your TV or computer. The camera binoculars are powered by 4 AA batteries which can be recharged or you can use a 6Vpower bank. These are not included with your purchase. You should get 9 hours of use unless you are using the infrared illuminator in which case the batteries will only last between 3 and 5 hours. You might also be pleased to note that these camera binoculars can be mounted onto a tripod; all you need is an adapter. You can even use this as a surveillance camera by adding a long USB cable from the camera to your computer or even your television. With the infrared function, you will be able to see anyone moving around outside. There is also a timestamp function and a GPS feature which will allow you to remember exactly where and when you took each picture or video. When you purchase this product you will get a complete user manual, a cleaning cloth, a soft carry pouch, USB cable, TV cable, and a neck strap. Users are generally very satisfied with this product. 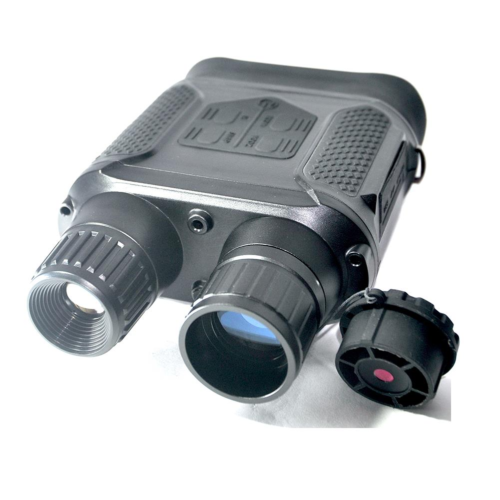 It has a 91% rating of 4 or 5 stars which demonstrates that it is an exceptionally good set of camera binoculars and deserves to be on the best digital camera binoculars list. However, there was a 1-star review which; combined with the additional features on the previous Bestguarder makes this the second best option on this list. This negative review questions whether the product is as good as technology from 20 years ago. Of course, this is an exaggeration which should not prevent you from purchasing this product. However, you should be aware that Bestguarder NV800 is a better product. Once again silver and black are the go-to colors for binoculars with a camera. However, although similar this offering from SGODDE looks a little different and has a different specification. The midsection of these camera binoculars remains black. However, the silver hinges extend into the arms much more than on the other models. While there is still a black section this is confined to the sides of the binoculars and is ribbed to ensure you have adequate grip, even when your hands are cold. The black is continued in the eyepieces and the inserts on the lenses giving these camera binoculars a professional finish. The buttons to control the camera remain in the same place, as does the memory card slot and micro USB plug-in point. The 2-inch screen is still situated at the end of the centerpiece however it is slightly lower to ensure a flawless line when the screen is shut. It is worth noting that the rubber coating on these camera binoculars is designed to protect the whole product if you do drop it. This is assisted by the fact that the binoculars arrive with a USB cable and a neck strap as well as a good user manual. This is one of the best digital camera binoculars simply because it packs so much into a small package. The overall size is just 3.94 inches by 3.94; small enough to be considered compact and fit into the palm of your hand. It weighs just less than one pound. The binoculars offer a magnification of x12 and have a 32mm objective lens, which is a good sized for spotting objects even in failing light. Of course, it won’t provide you with full night vision, you would need night vision goggles for that. The camera can focus on items as close as 8 meters and has a field view of 96 meters at 1,000 meters which is comparable to the other offerings on this list. The screen is 2 inches and the video records in AVI while the 5-megapixel camera takes JPEG pictures. The resolution is variable, from the top quality 1920 x1080 to the lowest setting of 640 x 480, there is an automatic control for white light, ISO and the sharpness of the photos. Exposure can be varied between 5.3 to -2.0 although you may find this is not a setting you use much. The camera binoculars do come with a 12-month warranty and a 30-day money back guarantee if you are not entirely satisfied. In addition, you should be aware that these are water resistant not waterproof, they should not be immersed in water and the power must always be off before putting in or taking out a memory card. Customer reviews of these camera binoculars are a little more mixed. Only 77% of users have rated it with 4 or 5 stars while a fairly large 15% have given just 1 star. The main issues seem to revolve around the binoculars not accepting a memory card and the fact that they do not focus. Only one person complained about the lack of linking between the camera and the binoculars, although others have commented on how easy this function works. This is enough to make you consider whether they are the right camera binoculars for your needs. However, they remain good camera binoculars for less than $100 if it wasn’t for the number of poor reviews they would probably have the best value award of the best digital camera binoculars review! 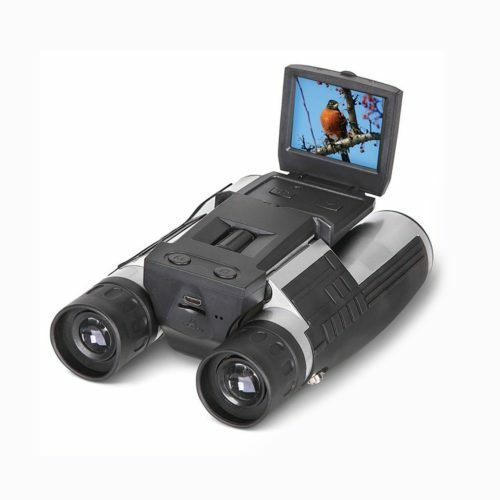 Digital camera binoculars are relatively new to the market but are an excellent idea. There are many times when you will wish you could photograph or even video what you can see through your lenses. Now, with a few taps, you can! Of course, there are many different offerings in this market sector and the price difference between the top end products and the bottom end is significant. It is, therefore, important to consider the following points before you select the right camera binoculars for your needs. As mentioned there is a large difference between the more basic models at approximately $50 and those which are at the top end with price tags of approximately $400. All of the best digital camera binoculars have a place and a purpose. However, before you decide which one will suit your needs best you should consider what funds you can afford to spend on camera binoculars. Setting a budget is important whenever you are considering purchasing something which is out of the normal. This is how you make sure you don’t consistently overspend and is an important skill to learn. It is important to consider what you intend to use the camera binoculars for. If you are an avid hunter and need to see in low light or even in the dark then the Bestguarder is probably the best one for you. However, if you are simply looking to get started in the world of camera binoculars then the best value is one of the offerings from Fitiger. Knowing what you intend to use your purchase for will help to ensure you choose one that does everything you need it too but that you don’t waste funds on unnecessary features. It is worth looking at the reviews to see what actually comes with your new binoculars. Many of them need batteries and these can be an expensive addition. You will also note that some do not come with protective cases or even neck straps. While you might not consider all of these items essential it is important to consider what comes in the package and how this compares to other, similarly priced packages. The greater the magnification the better you will be able to see things in the distance. This can be very important if you are hunting, watching sports or even bird watching. Consider how far you are normally focusing on when using binoculars. You can then make sure that your purchase gives you at least the required magnification, if not a little more. Also, you should also note that most examples of camera binoculars do not use the same lenses for the binocular and the camera. This means you need to check the magnification of the camera as well as the binoculars to ensure any pictures you take will be of a high enough quality. There are two types of focus distance. Firstly, is how far you can still see clearly and how wide the field of view is at this distance. This is especially important for hunters and sports watchers; you want to see as much as possible of what is going on. It will help to ensure you capture every moment or opportunity. The second is the close focus which might not seem as relevant for a hunter. Some binoculars with cameras can focus properly on objects just 2 meters away, others require double this distance. Your choice will be dependent on what you are hoping to see through your binoculars. Firstly, you will probably notice when you look at the details of digital camera binoculars is that there are many different specifications. You need to check what they are for the binoculars and for the camera; the specifications will be different as they serve different purposes. The higher the megapixel on the camera the better the picture will be, although the image sensor also plays a part in this. Likewise the better the magnification of your binoculars the more effectively you will be able to see things in the distance. Study the specifications and then you will be able to choose the camera binoculars which are best suited to your needs. Most of these products have buttons on the top of them which should be fairly easy to operate once you know which button is needed. Of course the more buttons there are the harder it will be to learn exactly which one you need on each occasion. Some cameras also have hard buttons which can ruin your pictures as it will introduce shake or maybe even leave your camera pointing at completely the wrong thing. If possible hold one of the cameras to assess how comfortable it is, how easily you can reach the buttons and how quickly you will be able to use it automatically. Main brands have already got an established reputation but this does not always mean they have the best products on the market. In fact, with a design that is still relatively new, there could be several contenders with better offerings. It is therefore important to consider the reputation of the manufacturer and seek out reviews on the actual products. Just as this best digital camera binoculars guide will illustrate to you why these 10 are all excellent choices, you will be able to locate user feedback and access honest opinions regarding each product. It is important to note that you should look at the overall theme of the reviews as there will always be individuals who have had a bad experience and wish to let everyone know. If the general view of a product is favorable then you can feel safe purchasing it. It is also worth checking the terms and conditions to ensure you know how to return it if necessary. Finally, you should consider if the camera binoculars you are choosing between have any special features that will make them stand out and if these features are useful to you. Additional features are likely to increase the price and can either persuade you to spend more than your budget or to choose a pair that is not best suited to your needs. Choosing the best digital camera binoculars requires patience and a methodical approach. These are a valuable and extremely useful tool for many people. They can also be a bit of fun, although if this is the case it is advisable to purchase some at the lower end of the scale. There is no doubt that camera binoculars will become more popular and the specifications will improve. At the moment many of the cameras attached to these binoculars are relatively low spec your cell phone is probably more powerful and capable of taking better pictures. Of course, these cameras have the benefit of the binocular lenses which means they will be able to take pictures more effectively at a distance. This list should highlight the range of products available to you. The best digital camera binoculars for value are definitely the CamKing FS608. The quality of the feedback and the reasonable price make this the best entry level binoculars with a camera that you are likely to find. Of course, if the price is of less concern, night vision is important or you simply want the best available then you need to choose the Bestguarder NV800. It is, without doubt, a set of binoculars with a camera that offers everything you or anyone else could need or want from a camera. It retails at just below $400 but is worth the expense. Whatever you do if you are considering buying this type of binoculars you should study the different options available and follow the guide we have provided. This will help to ensure you pick the right one.